Ah, The Hunger Games! A cult classic and a Hollywood movie franchise. How have I not reviewed this on the blog before? 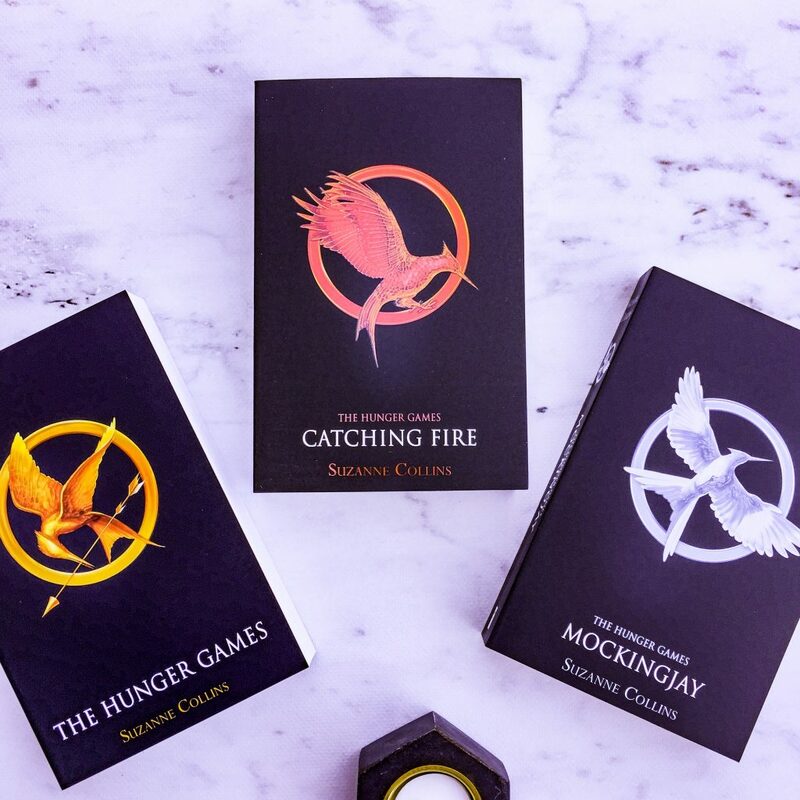 I recently reread the entire series and have found myself swept back up in the Panem world, fighting for Katniss and feeling empowered by the development of the series (even though I know everything that happens). The Hunger Games is a post-apocalyptic YA series set in futuristic North America. At the centre of the series we have Katniss Everdeen — she is strong, resilient, smart and a fighter. She must use her wits to survive in the games, where the last person standing wins. You either win or you die, and Katniss is determined to live. She hates the Capitol more than anyone. The Hunger Games is rather violent for a YA book series, but I think that’s one of the reasons readers love it so much. After all, you can’t have the main character entering a fight-to-the-death tournament and not have gruesome fights featured in the book. The high action plot is what I really loved about this book. I was desperate to keep reading to find out how Katniss was going to survive, but also how our other favourites were going to do in the games. Suzanne Collins was able to build most of the book around what happens in those games, drawing out power play and alliances but also showing us how the Capitol manipulates the games to make it entertaining for those in the Districts who are watching. To confuse my enemies, I start a fire with plenty of green wood. Even if they think it’s a ruse, I hope they’ll decide I’m hidden somewhere near it. While in reality, I’ll be tracking Peeta. One of the strengths of this book are the friendships and the side characters. Haymitch and Effie bring hilarity to an otherwise solemn and melancholic plot line. Katniss’ friendship with Rue in the games allows us to see an endearing side to Katniss, who at times can come across a little plain. And of course, Katniss’ friendship with Peeta is one of the things driving the book. Their budding friendship is the focal point of the second half of the book and we learn so much about their characters through their actions when they’re in the games. “Where is Haymitch, anyway? Isn’t he supposed to protect us from this sort of thing?” says Peeta. “With all that alcohol in him, it’s probably not advisable to have him around an open flame,” I say. And suddenly we’re both laughing. There’s a lot of hints about what’s the come in the series, particularly with the surprise ending. Collins does well to explain the world to us as we need to know things, so we don’t feel like there’s an info dump and we also don’t feel like there’s too much information we’re not privy to. The Hunger Games heavily relies on its first person narration, with Katniss being extremely honest with the reader and providing as much backstory as possible but also divulging her feelings and her doubts to the reader. At times, she can be a little overwhelming for the reader. I often found myself skimming paragraphs that were really just her reflective thoughts. I was mostly there for the plot and yet the book felt so heavy on character development that I felt myself getting a little tired by Katniss towards the end. Don’t get me wrong, she’s a fantastic protagonist. She’s just a little much in this first book. If you haven’t yet read The Hunger Games, this book is really for everyone. The characters are fantastic and the plot is addictive. And I also encourage people to read this if all they’ve seen are the movies. Suzanne Collins provides so much information and backstory that needed to be cut from the films so there’s a lot you can pick up from the books if you haven’t yet read them. The Hunger Games! I actually felt like the second book was even more internal, like Katniss shares even more of her thoughts and all of that stuff. But. I’ll have to re-read the series because my memory of the books is very, very sketchy. I really love the world building and character development, as well as the action of course. The way Suzanne Collins writes is just spot on, I remember NEEDING to read on to find out what happens next! The books are SO GOOD! It’s such a great concept and I loved re-reading them all.